Rochester, NY. Publisher: W.J. Erwood. Editor: Will J. (William Joseph) Erwood, editor and publisher, Florence Russell, business manager, Deane Erwood, publication manager. 1/1, January 1919-1927(?) $2.00 a year, 30-38 pp. "A Word to You. Do You Believe in The Life Worth While -- The Real, Vital, Rational Life? If You Do, This is YOUR KIND of MAGAZINE." 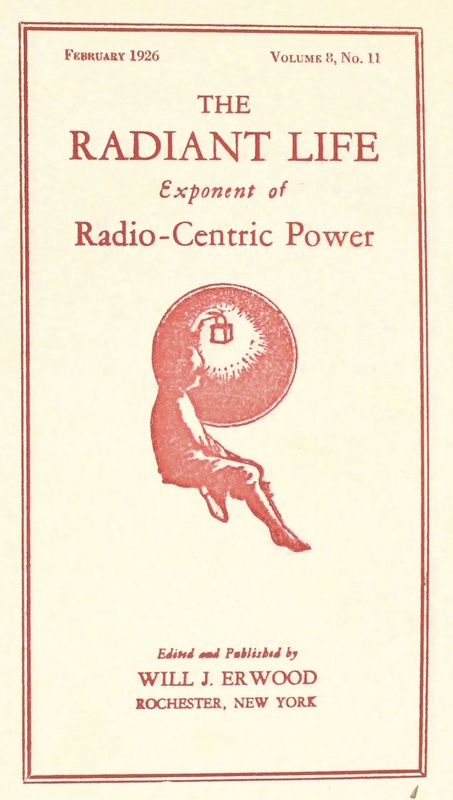 The journal proclaimed that it was "a magazine with a purpose," and that purpose was the development of "mind power." This seems to have been accomplished by following the instructions given by the likes of "an Intelligence" mediated at the regular Psychic Classes. Erwood (1874-1948) later edited The Mystic Key and Super-Psychology. He was a lifelong spiritualist (he channeled "The Teacher"), minister of the National Spiritualist Association, and active in the General Association of Spiritualists of New York, but early on he began to publish on the likes of Essentials of Psychic Development, Man's Spiritual Powers: A Revelation of the Superior Man. Unfolding the Finer Forces, etc., and finally turned his attention to "practical psychology." Erwood sold lessons on "Radio-Centric Power," "Clairvoyance," "Clairoaudience," "Clairsentience," and other undeveloped powers in man. He wrote for the Aletheian, the National Spiritualist, and other journals. University of Illinois; Wisconsin Historical Society; Skidmore Library, Lily Dale (2 copies, 1926 and 1927).